Most of us think we need at least three large meals a day to maintain a healthy body. In my experience, this leads to overburdening our digestive systems and increasing our waistlines. To solve this issue, we could try to eat only two meals a day, but we live in a world where three meals a day is the accepted norm. Often skipping meals can lead to overeating and snacking on unhealthy foods between meals. So how can we eat three meals a day without ruining the balance of our two main meals? The solution is what I call the LIGHT meal. 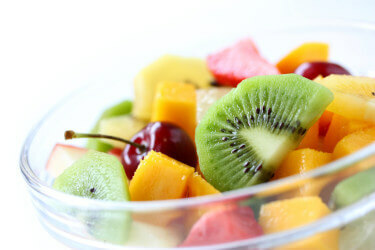 There are three options: A meal consisting of only fruit, or only vegetables, or a meal that is less than 250 calories. It’s easy to digest and low in calories, it will not overburden the digestive system, while still providing energy and a jump-start to weight loss. It can be a great way to help meet the National Cancer Institute’s suggested dietary guidelines for consuming fruits and vegetables daily. This meal is full of fiber. A LIGHT meal for breakfast starts the day on a positive note and gets you on the right track for the rest of the day. This LIGHT meal will help you prevent skipping a meal, which 30 percent of us do, according to study from the American Psychological Association. Compared to the big meals, it is quicker and easier to prepare and digest. The less-than-250-calorie light meal option is an opportunity to include healthier grains in your diet. Most people don’t get the recommended 25 to 35 grams of fiber a day. By eating fruits, vegetables, and whole grains, we can easily acquire the correct amounts of fiber. Your daily calorie intake will likely be in check because this meal is low in calories. I suggest you start with the fruit meal option. Fill a cereal bowl with only fruit. Experiment with different fruits because you will find that some fruits are more satiating than others. I like to eat melon in the morning, switching between the different types of melons each day. I also enjoy grapefruit or pomelo. If you want to eat more than one type of fruit at this meal, try combining various fruits. Some people like to mix oranges with grapefruit, mango with pineapple, or blueberries with strawberries. A fruit smoothie is a delicious, blended beverage made from fresh fruit and ice. Be careful not to overdo it when liquidizing fruits. Chewing the whole fruit is very satisfying, filling and has the fiber, which is often removed when juicing. If you really don’t like a fruit meal after sincerely giving it a chance, try the vegetable meal. Fill a large plate or bowl with salad or vegetables. Use only vegetables, such as lettuce, tomato, peppers, spinach, broccoli, cauliflower, celery, asparagus, and so on. You may also include vegetables, such as carrots, beets, butternut squash, pumpkin, winter squash, and peas, at this meal. Some people like to add these more starchy vegetables to a salad, and others like to bake or grill them and eat them separately. Add a low-fat or nonfat dressing (no hydrogenated oils) or a homemade dressing using equal quantities of olive oil and lemon juice or balsamic vinegar and herbs. You may want to begin with a vegetable soup. It should consist only of vegetables, water, and spices (herbal salt, garlic, fresh or dried herbs). Using a variety and large amount of vegetables will create a thick texture. Include butternut squash and blend the cooked mixture to make the soup creamy. It is a delicious, satisfying soup. If you still feel that this is not sufficient, try any meal that is less than 250 calories. The first few days of establishing a new positive habit are difficult. This is true about any type of change. The subconscious accumulation of previous bad habits compels us to continue with our old ways and behaviors. In my experience, after about two weeks of eating a LIGHT meal, it becomes enjoyable. I have seen people who were obese and obsessive about food get absolutely hooked on the LIGHT meal. If they tried it and love it, so can you. Once you get used to this invigorating, cleansing meal, you will not turn back. The LIGHT meal principle alone has the ability to transform the quality of your life.